Nvidia has seen explosive growth at its data centres operations. Shares of Nvidia hit a record on Friday, after it posted stellar quarterly results powered by higher demand for graphics chips used in gaming and data centres, and the rapid adoption of its new Volta chips for artificial intelligence (AI) and driverless cars. Shares of the chipmaker rose about 6% in morning trade on Friday, hitting a record of $217.18. Nvidia's gaming revenue in the latest quarter blew past Wall Street estimates but it was the data centre business, the driver of future growth, which made analysts stand up and take notice as revenue in the unit more than doubled. Revenue from the data centre business, Nvidia's second-biggest revenue contributor, rose to $501 million, beating analysts' estimate of $474.2 million, according to Thomson Reuters. "Data centre results have been stronger than forecast and we underestimated the value the market would assign to this franchise," Nomura Instinet analyst Romit Shah wrote in a client note. Shah raised his rating on the stock to "neutral" from "reduce". The company, which gets the bulk of revenue from gaming where it supplies chips for gaming consoles, has seen explosive growth at its data centres operations. 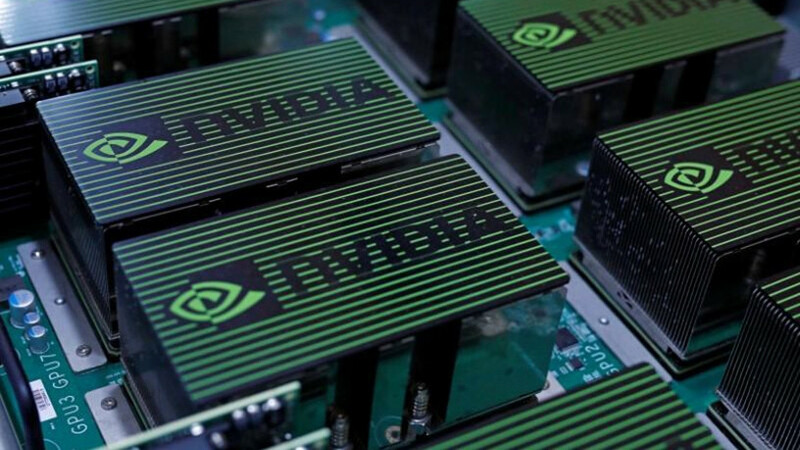 Nvidia launched the Volta chips in May as part of its Tesla V100 data centre graphic processing unit (GPU) that will power systems from AI to driverless cars. "Volta's launch we suspect was a major catalyst for Intel to go back to the drawing board with its AI chip Nervana, the tactical need to use AMD GPU, and the hire of Raja Koduri to head Intel's new Graphics effort," said Rosenblatt Securities analyst Hans Mosesmann. Last week, chipmaker Intel partnered with bitter rival Advanced Micro Devices for a graphics chip that will help the chipmakers take on Nvidia. Intel also named AMD's ex-GPU head, Koduri, as chief architect of the newly-formed Core and Visual Computing Group. "Shipments of the Tesla V100 GPU began in Q2 and ramped significantly in Q3, driven primarily by demand from cloud service providers and high-performance computing," CFO Colette Kress said. Nvidia's data centres business, which caters to clients such as Amazon's Amazon Web Services and Microsoft's Azure, was a point of concern after a disappointing showing last quarter. But the Volta chip changed all that. "The ramp of Volta seems to be tracking well, and more importantly, has significant runway ahead, in our view, as a broader set of customers adopt the new architecture in the coming quarters," Goldman Sachs analysts wrote in a client note. The company claims Volta will fuel breakthroughs in every industry and humanity's moon shots like eradicating cancer, intelligent customer experiences and self-driving vehicles. At least 14 analysts raised their price target on the stock. SunTrust Robinson analysts were the most bullish with a price target of $253. Nomura raised its target to $190 from $110. Out of 37 brokerages covering the stock, 20 have a "buy" or higher rating; 14 on "hold" and three on "sell" or lower. Including Friday gains, Nvidia shares have soared more than 100% this year, making it a top percentage gainer on the Philadelphia SE Semiconductor index.